Samuel De Veaux was born on 12 May 1789 in New York City. He married Maria Woodruff, daughter of Ezekiel Woodruff and Sarah Hall, circa 1813. Samuel De Veaux became a widower at the 23 April 1815 death of his wife Maria Woodruff. 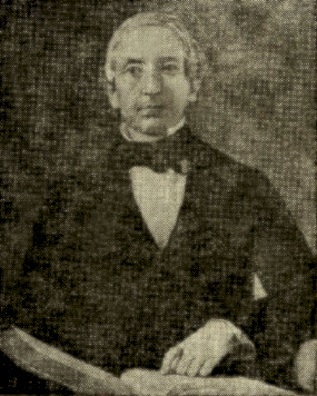 He married Sarah Woodruff, daughter of Ezekiel Woodruff and Sarah Hall, circa 1817. Sarah was the sister of Samuel's first wife Maria Woodruff..
Samuel De Veaux and Sarah Woodruff appeared in the US federal census of 1 June 1850 in Niagara, Niagara County, New York. Other members of the household included Henry Augustus Woodruff and Henry A. Woodruff Jr.
Samuel De Veaux died on 3 August 1852 at age 63 in Niagara Falls, Niagara County, New York. Sarah Woodruff became a widow at his death. He was interred at St. Davids United Church Cemetery, St. Davids, Niagara County, Ontario, Canada. The following appeared on 4 August 1852 in a local newspaper: Judge DeVeaux, of Niagara County, and the richest man in that section, died at the Falls of Cholera Morbus yesterday. He was 63 years of age. Previously unpublished biographical material on Judge Samuel DeVeaux, founder of DeVeaux School, will be icorporated in a new book, "The History of DeVeaux School, 1853-1953," to be published later this spring. Announcement of the new work, written by Donald E. Loker, a former history instructor at DeVeaux, now employed here by the State Power Authority, was made during a school assembly Monday commemorating the 110th anniversary of the chartering of DeVeaux School. The work is a result of research done for the school's centennial in 1953 and continued since then. The story of Judge DeVeaux, a Niagara Falls pioneer who gave his name to a section of this city, may largely be forgotten because he had no children to carry on his name or memory. Judge DeVeaux was a descendant of French Huguenots who fled to America in 1675. He was born in New York City in 1789 and left his family at the age of 14 to work as an agent for the Holland Land Co. in Canandaigua. At the age of 18, in 1807, he came to the Niagara Frontier to work as a clerk in the commissary at Ft. Niagara. A map of the area, compiled in 1812, shows the name DeVeaux on a section of land near the fort, indicating that he began early to invest in land. He married Maria Woodruff of St. David's, Ont., in 1813 and in 1817, two years after her death, married her widowed sister Sarah. Judge DeVeaux's body was buried in the Woodruff family lot in St. David's. In 1817, Judge DeVeaux settled in Manchester, then a hamlet on the edge of the falls. Here he started a trading business which, for years, was the only trading post between Rochester and Detroit. Judge DeVeaux has been characterized as the first merchant of Niagara Falls. In 1847, he was instrumental in the incorporation of the Village of Niagara Falls. Judge DeVeaux's business prospered and investments he made in real estate became valuable. He was named a justice in 1823 and from then on retained the title of judge. He served for one year in the state legislature, was postmaster for a while, and was one of the organizers of the Suspension Bridge Co. Interested in the development of the falls as a tourist center, Judge DeVeaux wrote "The Falls of Niagara" in 1839 as a guidebook and in 1841 published "The Traveler's Own Book to Saratoga Springs, Niagara Falls and Canada." A founder of the First Presbyterian Church, his affiliation with the Episcopal Church became permanent after his confirmation in 1829. John was born in 1748; married, 1st, Mary Buel about 1771, when he moved to the city of New York and entered into business, but on the commencement of the Revolution he moved away. His father died in 1777, when his brothers Peter and Isaac paid him £100 in lieu of landed property and according to the will of their father. By this (first) wife he had a son named Charles and one or two daughters, after which or during the War the wife died. At the close of the War John again returned to the city and engaged in business, and married his second wife, Eunice Blake, in 1786 or 7, by whom he had Samuel, John B., Margaret, Maria, and another daughter who married John Williams.
. . . I appoint as my Trustees, William H. De Lancey, William Shelton, Peter A. Porter, Richard H. Woodruff. I will and bequeath all of my estate, both real and personal, which I am possessed of now and at the time of my decease, (excepting what is reserved in the settlement with Mrs. De Veaux, and as is herein excepted) to the persons last above mentioned, and their assigns, in trust for the uses and purposes hereinafter set forth and particularly specified. The said Trustees are to pay my niece, Susan D. Flagg, of New Orleans, or to her heirs, the sum of five hundred dollars a year for twenty years; to be remitted to her, or to be paid personally, by the first day of May in each year. The first of which payments shall commence and be made on the first day of May next after my decease. It would be well to fund safely a sufficient sum to meet this annual demand, as soon as it may be at the command of said Trustees. Said Trustees are to pay Charlotte De Veaux, widow of my deceased nephew, William De Veaux, of New Orleans, the sum of five hundred dollars. They are to pay to the children of my deceased niece, Margaret Warner, of New Haven, Ct., the sum of two thousand dollars, to be equally divided among them. They are to pay to my niece, Maria D. C. Haynes, a sufficient sum to meet the balance due on ten shares in the Niagara Falls International Bridge Company, which shares I have transferred to her. To be paid as the installments are called for on the part of the Company. They are also to give to the said Maria, a certain note which I now hold against her husband, Daniel C. Haynes, or the proceeds thereof, if such note be paid to me before my decease. They are to hold in trust for the use and occupation of my nephew, Samuel D. Williams, the middle part of Lot number three, (3) in Township 13, Range 9, in the town of Niagara, and county aforesaid. The wife and children are in no case to be disturbed in the occupation of said premises; and when the children become of age, the said Trustees or their assigns, are to convey said premises to them, in fee simple. The said Trustees are also to pay one thousand dollars to said Williams, his wife, or children, from time to time, as they may think most beneficial for them. The amount standing against him in my books is not to be considered as any offset, or as a demand against him--and is not to be collected. . . .